Lamont Coombs made a tapered tang Bird and Trout. 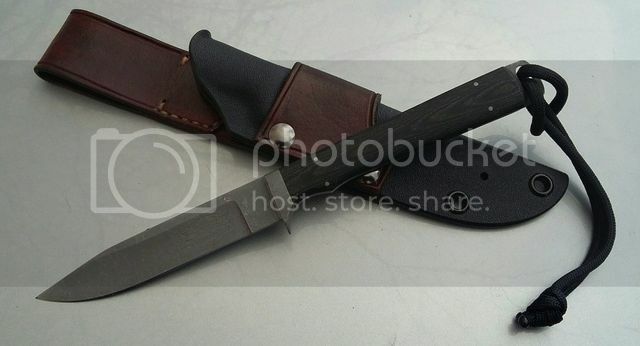 Modernized the design and created a combination leather and kydex sheath. He is making me a woodsman style pouch sheath in a 1920's pattern for it. Such a humble guy. One of the greatest blade makers in a generation. Never see him at a show that he doesn't have his elderly Mom in tow. I just generally really like the guys approach to life. It is reflected in his lifetime body of work. Some folks work towards titles such as "Master BladeSmith". I applaud anyone who has earned such accolades. They have obviously earned their stake to fame at great expense of personal effort and sacrifice. Then again...you have to measure this against natural talent and ability. There are artisans out there that still have groundbreaking skillsets that the "Masters" are still playing catch up to years later. 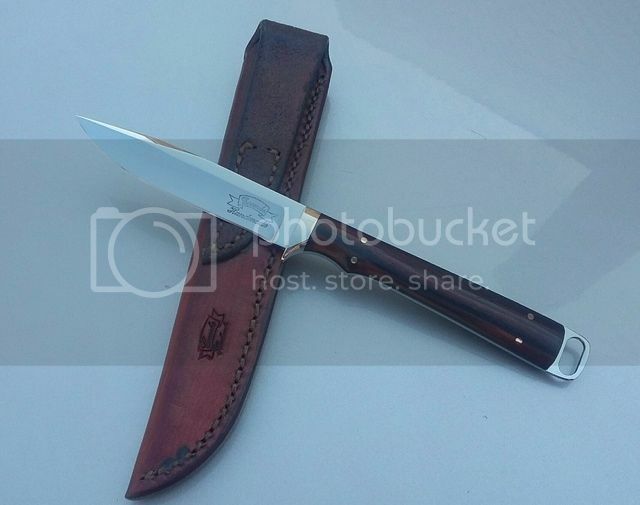 I'd rather have a simple user knife by Lamont...then a bling knife by a "Master Bladesmith" from the Guild. Your mileage may vary... just some of my rambling train of thoughts. Older I get...less control I have of these musings. Nice looking knife, but then I seldom see a knife I don't like. The ratio of handle length to blade length looks good. I think there is a niche for Master Bladesmiths as they do know some things about metallurgy that gives them some fabrication skills that regular folks don't have. Education and skill doesn't always translate to artistry though. That said, both the ABS and the Guild are chock full of master blade smiths that don't produce 'bling', but functional, beautiful knives. It's not easy, or quick, to advance up in either association. Like any other craft area, design and embellishments vary from craftsman to craftsman. I'd not lump them all together. Same basic knife with some profile improvements to the grind. Mirror polish and Coco Bolo scales. New pouch style sheath. Looks like jewelry! VERY nice! Giz, that is a gem! WOW!